In God’s Word we find illustrations referring to the olive tree, which would have communicated clearly to the believers in Bible times. Understanding some of the literal aspects of the olive tree of the East helps our Western minds grasp the meaning of the scriptures relating to the olive tree and its resources. Above all things, the olive tree has symbolized national or individual well-being. In the Bible, oil from the olives is used figuratively of prosperity, abundance, joy, friendship, and vigor. Asia Minor is considered the original home of the olive tree, and the trees can be seen all over the landscape of the Near East. The color of the leaves is a dusty silvery gray, something like silver birch or willow trees in foliage. It is considered an attractive tree, a tree of beauty. In a prophecy recorded in Hosea 14, God likens Israel to the beauty of the olive tree. The olive tree flourished among rocks and poor soil in groves scattered on the mountain slopes of Galilee, Samaria, and Judea, and on the Mount of Olives near Jerusalem. When trees were planted by the owners, they were planted in groves. Each grove was owned by a different person. The groves were not put in enclosures, like a wall or fence. The olive grove owners needed a lot of patience. The young olive trees would not start producing for seven years, and it would be about fourteen years before they matured and had full growth. The trees continued to yield fruit to a very old age. They were loaded with blossoms in June. A breeze would make many fall, so some blossoms did not bear fruit. 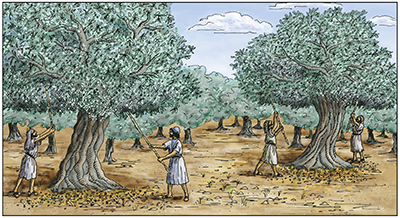 “Shaking the tree” was another method of gathering olives. It’s easy to see how there would be fruit left on the tree after using these methods. The Prophet Isaiah uses the illustration of shaking and beating the olive tree to relate a truth about the few believers who “remained” amidst the evil of their day. For so shall it be in the midst of the earth among the peoples, as the shaking and beating of an olive tree, or as the gleaning when the vintage is done [and only a small amount of the fruit remains]. But these [who have escaped and remain] lift up their voices, they shout; for the majesty of the Lord they cry aloud…. Because of this harsh method of harvesting, the olive tree only produced a full crop of olives every other year. The olives were used every day with meals at home, as well as with the lunch for men who worked away from home. They took small, thin loaves of bread and olives for lunch. Once harvested, many olives were crushed and then pressed to squeeze out the oil. For the farmer, the oil brought in the income needed for daily living. The earliest use of oil recorded in the Bible is in Genesis 28. And he called the name of that place Bethel…. Bethel means “house of God.” Jacob anointed the pillar with oil and vowed a vow at this location. It was a special occasion. Another special use of oil was in the anointing of the priests and items in the tabernacle. The olive oil used for this anointing had to be specially prepared. It was not used for ordinary purposes. The directions for its preparation and use are found in Exodus 30:23-33. The oil was composed of pure myrrh, sweet cinnamon, sweet calamus, cassia, and olive oil. It was made according to the art of the apothecary, or perfumer. In the day of Jesus Christ, we see oil was used in the anointing of the sick. …and let them [the elders] pray over him, anointing him with oil in the name of the Lord. Olive oil was used for many other things. One of the most important uses for the family was in the cooking of meals. It was used in place of butter. Olive oil was applied to the body for healing and added to ointments made from herbs…. This is an excerpt from the March/April 2006 issue of The Way Magazine.